I am a traditional artist from the United Kingdom. I specialise in detailed and realistic pencil drawings. Much of my artwork is black and white, done using graphite pencils. I also do colour pencil drawings and colour pastel drawings. All my artwork is highly detailed and realistic in style. I especially enjoy drawing people and portraits and also gothic and fantasy art, but I draw a whole range of other things too including animals, landscapes and much more. I have always loved drawing and I found I had a talent for it at an early age. As a child I would draw whenever I could, if there was piece of blank paper lying around anywhere it would not remain blank for very long. As I grew up I used to draw as much as possible in my spare time, drawing things from television, films and music related stuff, practising and improving my technique all the time. In later years I started doing much larger artworks and did a lot of drawings for family members and friends. In 2009 I became a member of the website Deviantart. I was inspired so much by what I saw! I was amazed by the wonderful art on there, especially some of the detailed portraits and the fantasy art. There was no stopping me from there, I would draw every chance I could get! I studied tutorials and got tips and advice from other artists to help improve my skills and technique. I started drawing lots of portraits from that point, something I found I really enjoyed. I continued from there, drawing many more portraits and also started doing more gothic and fantasy art and a whole range of different things. It’s clear to say that I would probably not be where I am today if it wasn’t for deviantart. My artwork has been featured many times on ﻿Deviantart﻿, being regularly featured in groups, artists journals and news articles and my art has had much praise. I have been very successful on the art website ﻿Shadowness﻿ too, where I’ve been awarded a featured portfolio and many daily inspiration awards. Recently exhibited in Tamworth, UK, having a large selection of my artwork on display at Tamworth Library for the month of November 2014. I love to draw and create artwork and it pleases me so much to know that other people enjoy my art too. 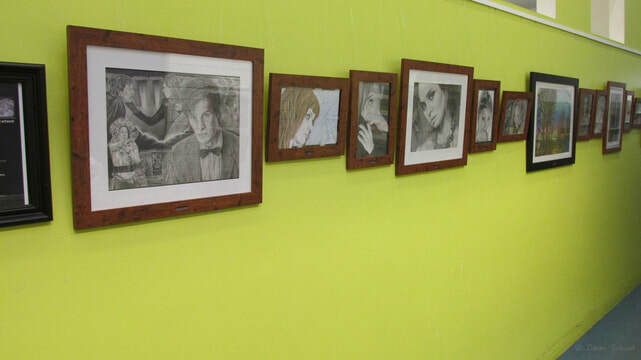 My artwork on display in a recent exhibit in Tamworth, UK.